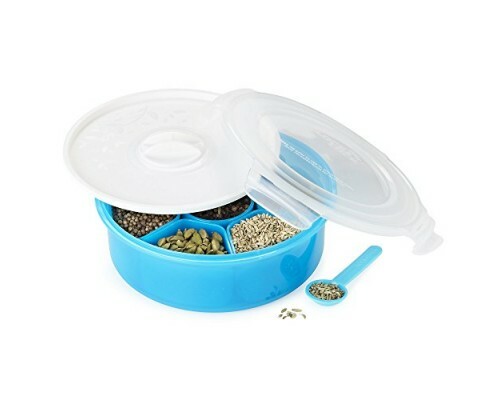 A traditional spice box for the storage of your essential authentic spices in one handy container. We made completely from stainless steel including seven individual compartments, an inner lid to protect the spices and a lid to close. This spice box is a must for any enthusiastic curry chef. Our stainless steel masala dabba and spice box, this high quality contains individual spice canisters with transparent lids to keep the spices in optimum condition. The canisters all fit neatly into the spice box which also has a transparent lid and a measuring spoon. All of the canisters are individually laser marked with a spice name to assist you in identifying each spice whilst you are learning the art of Indian cooking, these are 7 Ground spices: Chili, Coriander, Cumin, Fennel, Gram Masala, Ginger and Turmeric, 6 Whole spices: Cardamon, Cloves, Cumin seeds, Mustard seeds, Bay Leaves and Cinnamon sticks. Car boot sale ad details Lock & Lock Spice Box and Masala Dabba -20cm / 8inch for sale in London. Lock & Lock Spice Box and Masala Dabba -20cm / 8inch available on car boot sale in London. More Kitchen & cooking for sale in London and more second hand sale ads for free on 2lazy2boot - London car boot fairs - 33252.